Queensland’s first ever Pride Cup match has been hailed a rousing success by Robina Roos Captain, Hanna Blaine. 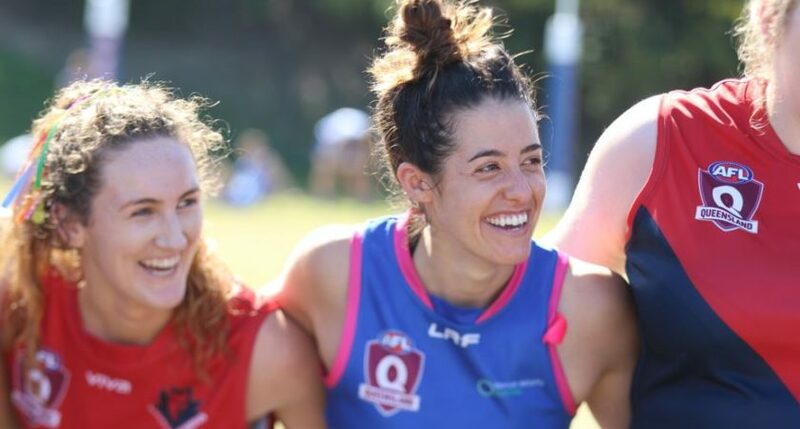 The second-place Roos enjoyed a win in their marquee game of the season which celebrated inclusivity in sport, defeating Surfers Paradise by 57-points. Blaine finished the day with three goals for her side and won the Pride Cup Medal as the game’s best player. Following her match-winning performance, the captain was happy to celebrate in the success of the Pride Cup. “Sport is a place where you can come and be accepted. It’s quite special for us to celebrate that on a particular day,” Blaine told aflq.com.au. The Robina Pride Cup was organised by Women’s Team Manager Sally Crosswell, who worked tirelessly to prepare for the event. Crosswell fielded interest to run the event months ago by posting in the team Facebook group and nervously awaited a response. She was met with overwhelming support from the Robina QWFA Division 2 South side who are competing in their first season. “Sally, our Team Manager got the idea along with a few girls in our team based on some of the work that’s been done in Victoria and New South Wales,” Blaine said of Crosswell’s tireless work in the lead up to the day. Robina’s Prospect Circuit Oval was awash with the LGBTIQ+ colours from as early as 9am on Saturday morning and the celebrations lasted long into the afternoon. Both Robina and Surfers Paradise ran through rainbow banners prior to the game and even locked arms together before the first bounce. Each goal was signalled by goal umpires waving rainbow flags alongside family and friends in the crowd doing the game. To be a part of such a historic event for community football in Queensland was a proud moment for Blaine and both teams; something that was acknowledged by all on the field.